Everything in JORVIK is based on archaeological evidence – nothing is made up. Another 16 years of academic research told us even more about Viking-Age York helping us to update the JORVIK experience. Opened 7th April 2001 visitors could get even closer to understanding what life was like for inhabitants of JORVIK, as they journeyed through Viking life as it was at 5:30pm, 25th October, AD975. On arrival at JORVIK Viking Centre visitors were invited to board a specially commissioned time machine the doors were sealed and with some degree of light turbulence, you were hurtled backwards through time, creating the very real sensation of high-speed time travel! In-flight entertainment consisted of a film showing the changing style and appearance of York’s streets and residents, as passengers were taken backwards in time through the centuries. With a sudden jolt the time machine malfunctioned and sped back too far, to the year 866AD, the year when Vikings invaded the city of York! The latest technology greeted time-travellers as they boarded the suspended, six-seater, time capsules. Starting at the year 866AD, the capsules transported visitors through the war-like early Viking era and forward more than 100 years to the city of York, or JORVIK as it was known, in AD975. Guided by TV historian, Michael Wood, visitors to JORVIK journeyed past the home of the antler worker, the blacksmith, the wood turner, the home and workshop of the butcher and finally arrived at Coppergate, a market street with the stalls of a leather worker and a moneyer. For the first time, Jorvik was populated by animatronic Vikings, which gave visitors a sense of the activity in the 10th-century city. Away from the hustle and bustle of Coppergate, the time travellers turned the corner to where a house was being repaired for fire damage, in the exact spot that it burned down more than 1,000 years ago. A shift in gears and the time capsule propelled visitors forward at speed back into the 20th century, where they found themselves at the site of the original Coppergate dig of the 1970s. Here they witnessed the excavation, in progress, of the Viking city they just travelled through, at the time it was first discovered by the York Archaeological Trust. 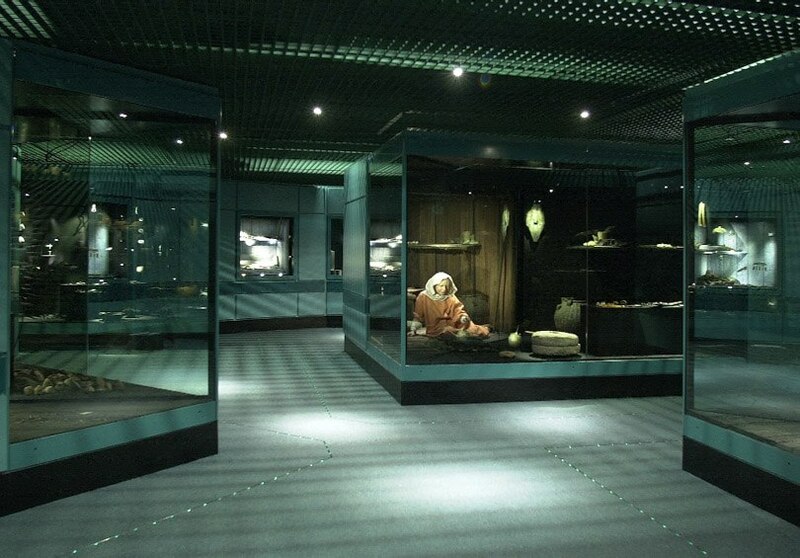 The new artefacts gallery at JORVIK displayed over 800 objects found during the Coppergate excavations. They were displayed to illustrate their associations with each other and to show the real-life contexts in which they would have been used. This was achieved in four large cases – Leather Working, Hearth & Home, Blacksmith and Woodworking – by using techniques of illusion to combine the ancient objects with their Viking-age backgrounds. In January 2006, the gallery was transformed into Artefacts Alive. Using state-of-the-art technology, four Viking ghosts appear in holographic form, all willing to give their first-hand account of their lives in the bustling city. Visitors come face to face with the silver-tongued leatherworker, Mord, and cheerful housewife, Drifa. Also making an appearance in the exhibition are the apparitions of bumbling wood turner, Unni, and Grummi, the meanest blacksmith in JORVIK.